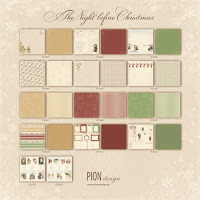 Today I have another Christmas card designed using the new Pion Design collection "The Night Before Christmas". 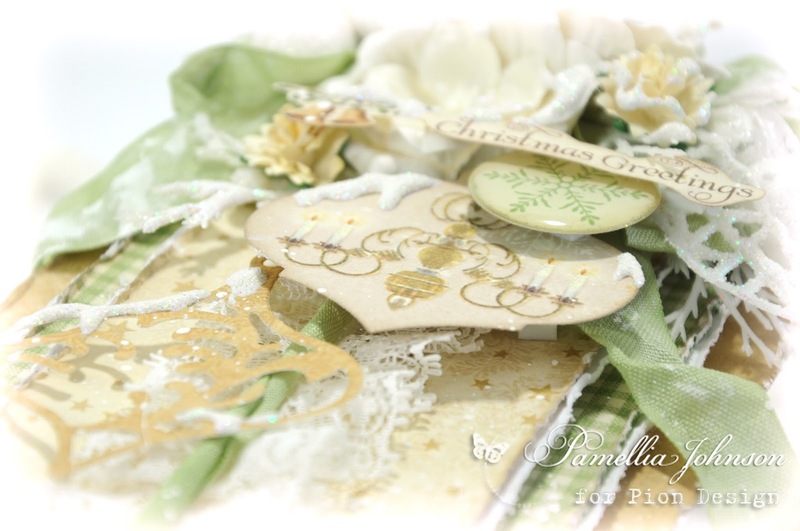 I just love how you can do any style with these papers, from shabby to vintage to elegant! I used two different ornament dies on this card, but I have no idea what brand they are. For some reason, I forgot to label them, so if anyone know, shout them out please! The flowers are from Wild Orchid Crafts, everything else is from my stash. So we got our snow dumping as predicted. Oh boy, I was jumping for joy and ended up spending about 5 hours outside in the wind and snow. I was frozen stiff by the time I got home, but it was totally worth it!! For my landscape photo today, a little trick of the eye. What looks like a field of snow covered flowers, is actually the top of a line of untrimmed hedges. and one of many Chickadees I fed that day! 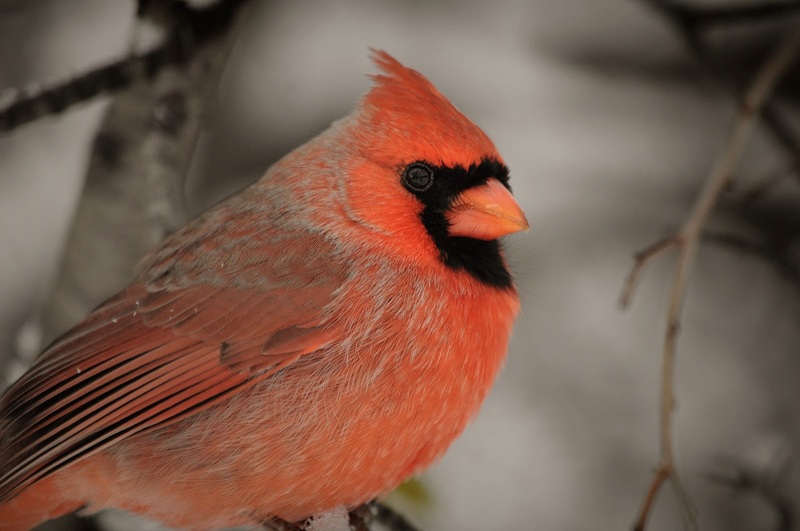 I've become completely addicted to the gorgeous male Cardinal and how he shines in the snow, so I will be including a shot of one of these beauties every post from now on!! My squirrel friends were not quite as impressed with the snow as I was. "Hey, you up there. I see you're very busy, but can you toss me a peanut please. I'm freezing my paws off down here! "I suppose you think this is funny!!" "No way I'm coming down there lady! In case you haven't noticed, the ground is covered in snow!!" I didn't get any new macro shots because it was just too windy, and for a successful macro shot, you need no movement whatsoever. I still have some back ups, so I will share those for this week. Some ice crystals on a leaf. Stunning card and a great shape-layers look different that way on I think. 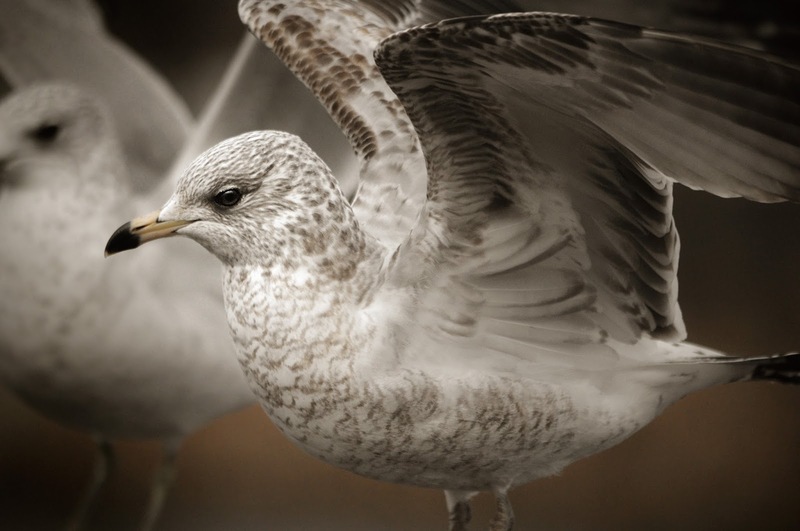 What amazing photographs and the birds sparkle in them. They must like the snow and ice I think. I see the snows have arrived in your parts Pamellia, lovely photos. Another fabulous creation as well. Stunning card with wonderful colours, love that soft green! 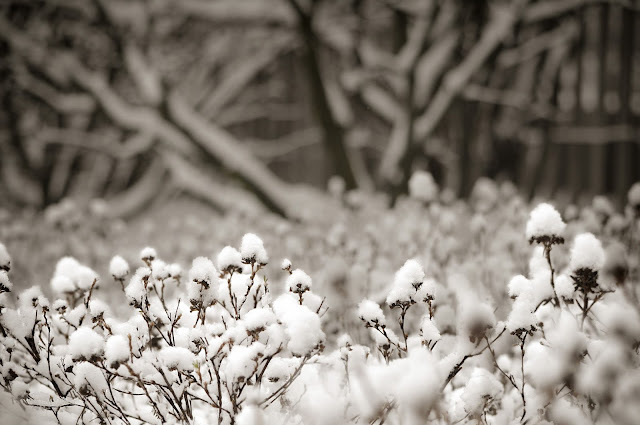 Amazing, magical photos too, - how lucky to get snow!! Oh my gosh, what a stunning card, Pamellia!! I love the design of this one with the bouquet of flowers on top!! The colors are so beautiful!! The chandelier and ornaments are gorgeous!! The lace down the center is a perfect touch!! Love, love, love it!! So amazingly spectacular!! Another fabulous card, Pamellia! I am so jealous of your snow! The photos, as always, are wonderful! Gorgeous Holiday card Pamellia! Love the floral arrangement and the ornament embellishment. You card is just beautiful and your photography is absolutely outstanding!! Please send your photos into Life mag or Nat Geographic!! You are soooo talented dear friend! Jackie is sooo right! You've got to do this! 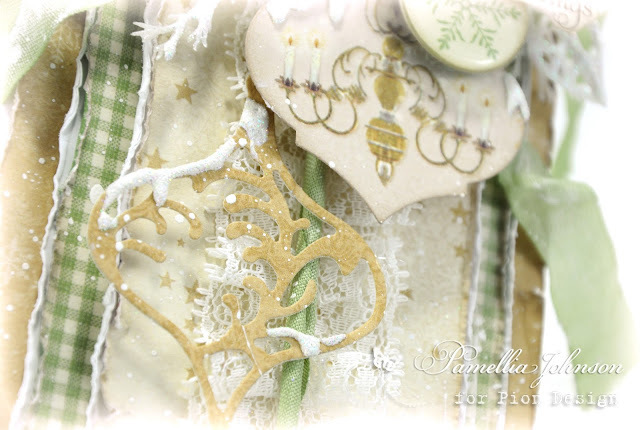 So gorgeous Pamellia..I love the floral top with the baubles comimg down and lace trim through the centre..just beautiful.Awesome photos..I feel so much for the tiny animals in the snow..thank goodness they have you to top up their feeding..
A spectacular card Pamellia, so beautiful in those soft green and gold tones. 5 hours out in the snow?!! Bet you WERE frozen! 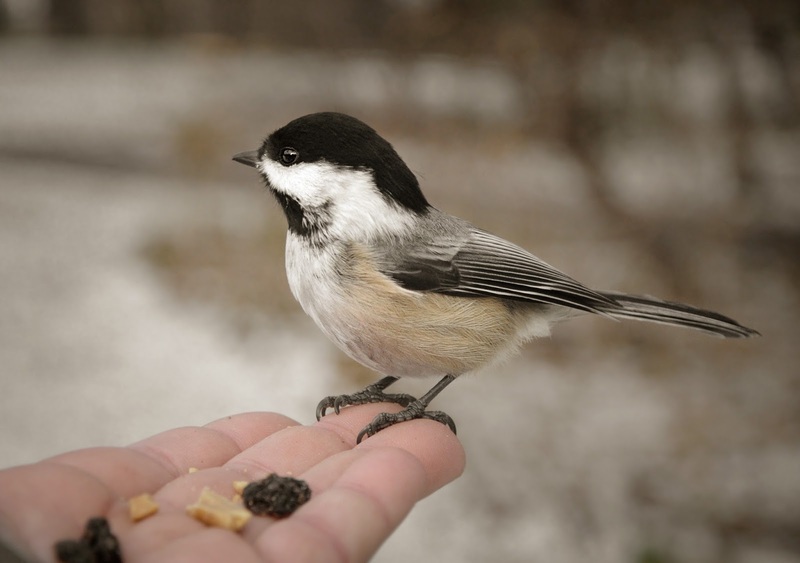 Wonderful photos though, and your animals and birds need you more than ever in this weather! Awww.... Such elegant and sweet card you shown us today!! Love, absolutely love the lace from the top to the bottom and this awesome floral bouquet!! Fabulous design! Amazing green and neutral palette, too!! 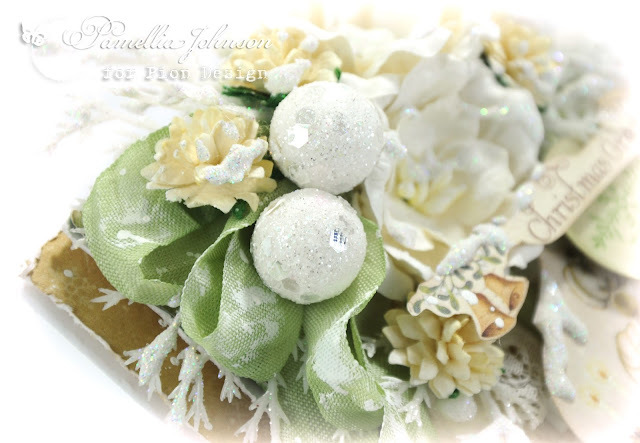 The little snowflake looks so cute and the baubles are just marvellous! 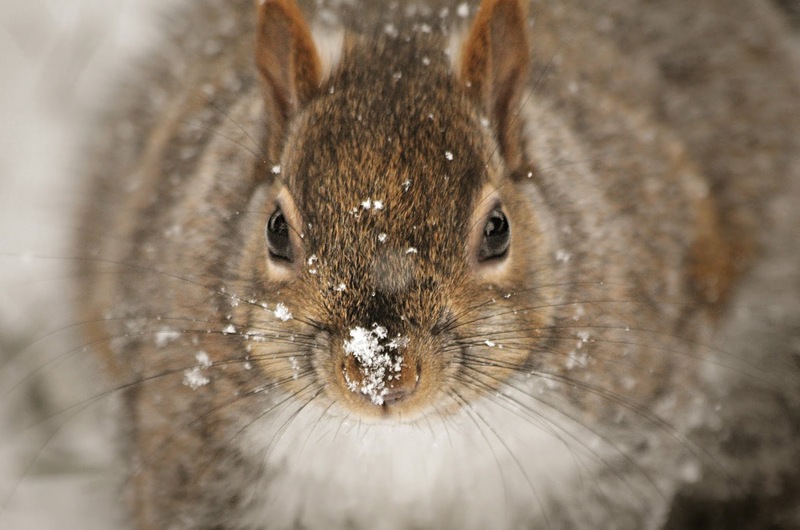 I'm so glad that you enjoyed your snowy day, my friend! :) Your photos made me smile so much! 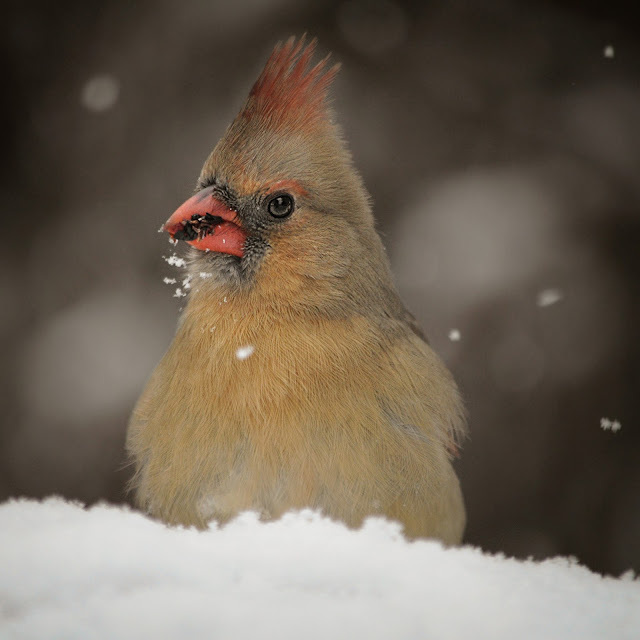 These little birdie are all very cute and the cardinals really pop out from the snow with their fab colours! 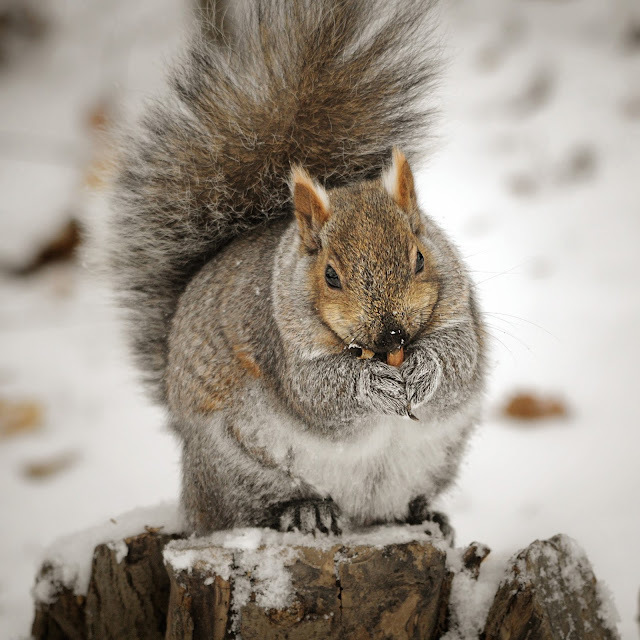 The squirrels look as cute and fun furryballs!! 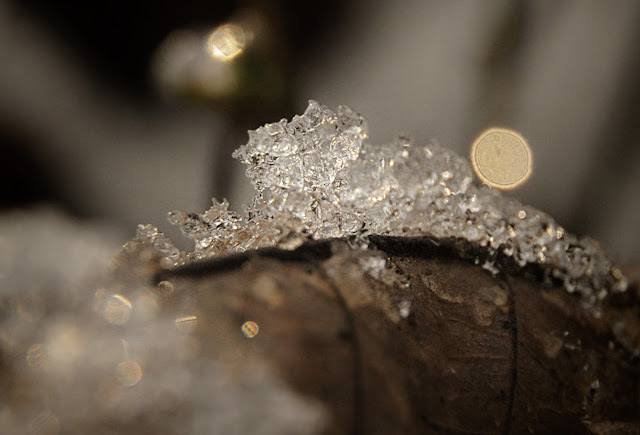 Beautiful macro of ice and your landscape photo is just amazing!! I just love the design of your card, the papers are indeed wonderful but in your hands they are amazing! I love the chandelier too! 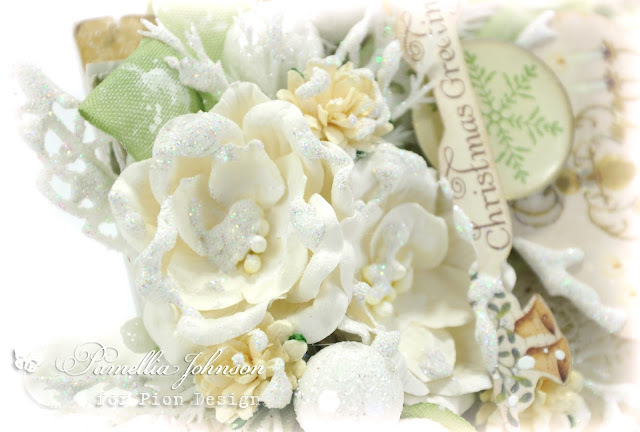 Gorgeous Christmas card Pamellia! love these colours and gorgeous embellishments you have used.. Your photography is absolutely outstanding!! how lucky to get these shots you get..
Beautiful details on the gorgeous card, I really liked this colour combination you used. Super photos and you can hardly blame the little ones not wanting to get their feet wet in the snow. The cardinal is a awesome. 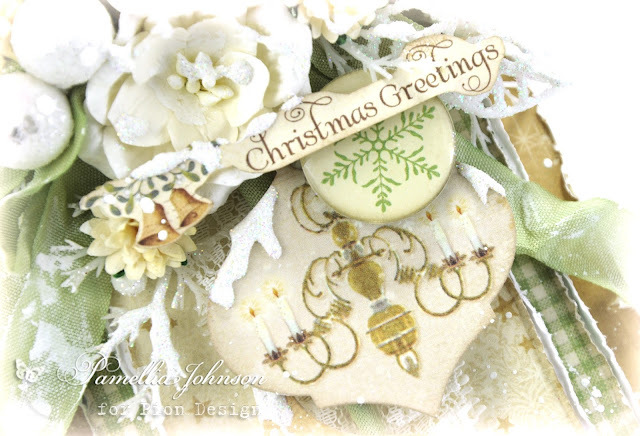 Gorgeous card love the soft colours and all the embellishments . 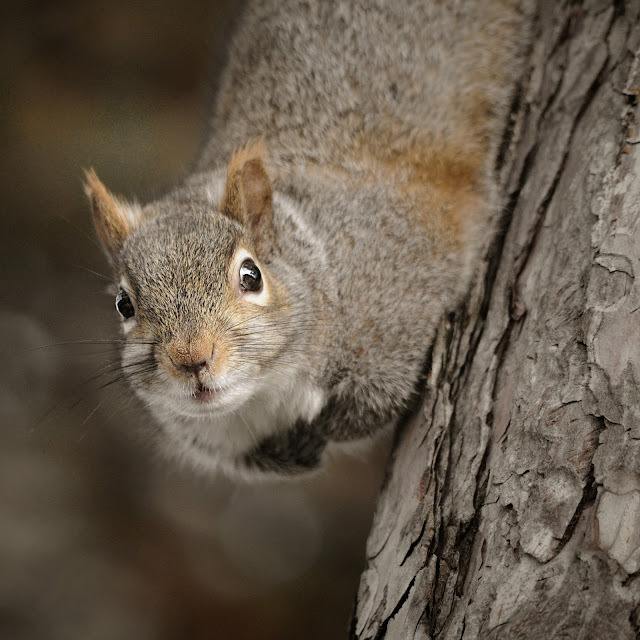 I would say your furry friends are smart not to come down from there home in the trees . We have lots of snow here in the Maritimes too . Planning on travelling to Ontario for Christmas just hoping the weather won't cause problems . 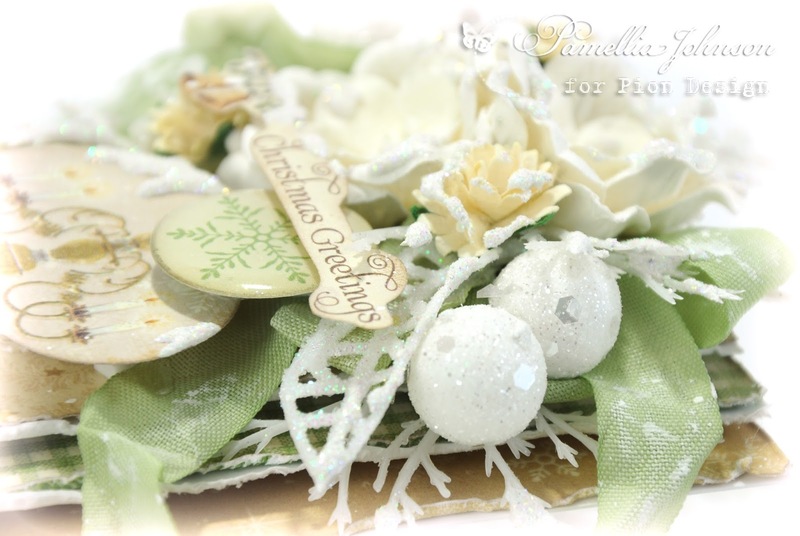 Love your card Pamellia - the soft greens are gorgeous!! 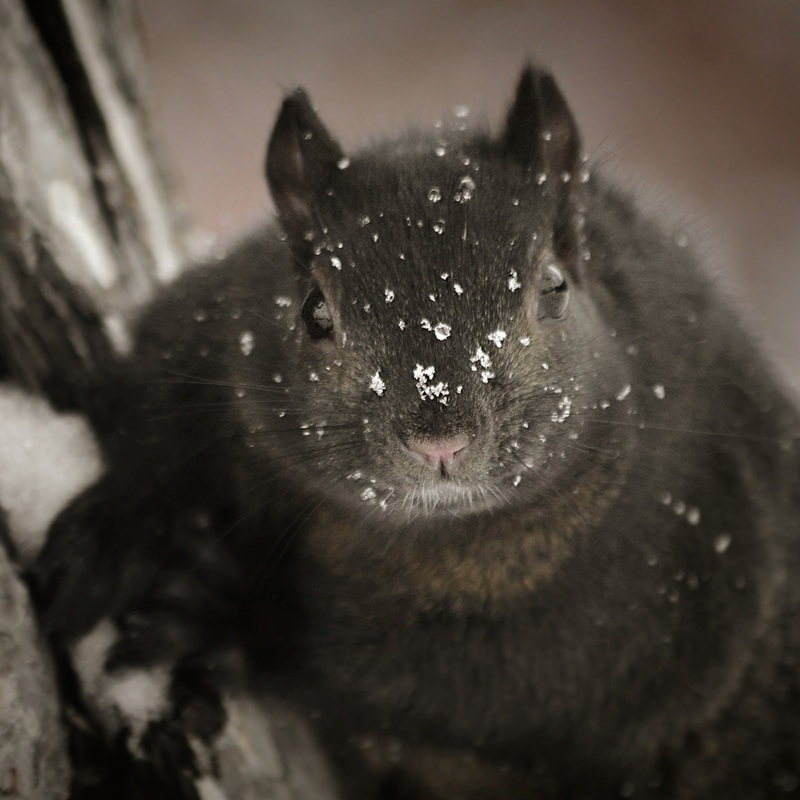 You time outside was certainly profitable - love all your photos, especially the squirrel which is winking!! A gorgeous card Pamellia. I love the design and the soft green and gold colourway. The lace ruffle and twisted ribbon look fantastic and all the sparkle is amazing. Beautiful card and wonderful layers! I just love the way you pack every layer with amazing and spectacular embellishments and elements! Love, love this!! Your pictures are amazing! You capture these critters perfectly! Your love of photography shines in every photo you take! You are a natural...thanks for taking the time to share these...love seeing your posts my friend! Oooooooh my, another spectacular vintage Christmas card from you, Pamellia! The chandelier and ornaments are fantastic! I adore the design and your fabulous color combo of soft green and gold! It looks magical! You know how much I love your brilliant photography! That landscape one is out of this world beautiful! I am completely blown away by your huge talent, my friend! 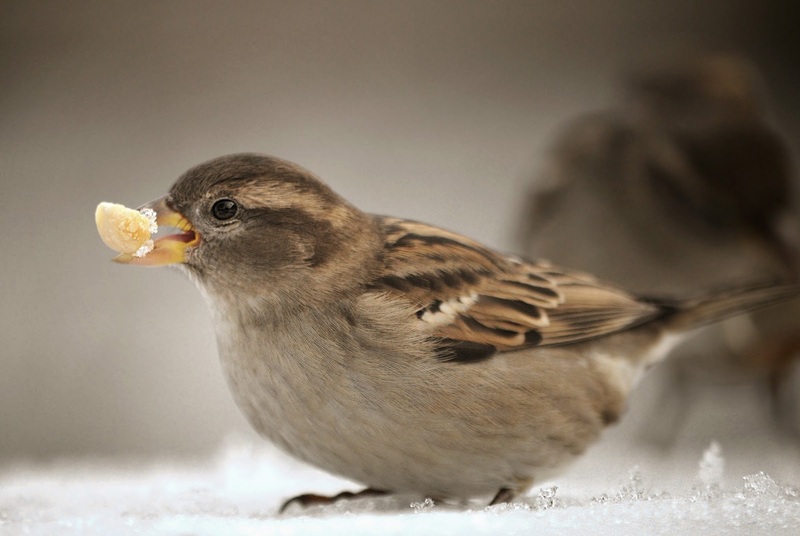 Beautiful ... your card and your photos ... That sparrow has stolen my heart! Gorgeous post, Art and photos. Love the card, the twisted ribbon? a great idea, love the lace, love the colour and the check paper, LOVE Everything! Your photos as always are amazing and 5 hours in the snow, Brrrrr! LOL Love the bokeh in the micro shot and your hedges! Never thought of using those shades on a Christmas card but they so work. Love the little ball embellishments too. A beautiful festive make. Glad to hear that you are venturing out but 5 hours in the snow? Eeeeek! Everything about this post is totally fabulous my friend. Gorgeous card, tall and elegant, beautiful papers and wonderful design. I love it. AND THE SNOW!!!!!!! How exciting is that, fantastic photographs, I bet you had the greatest time out there with your camera. Amazing! One thought about your your Cardinal birds. I should mention that we do not have these birds, so I have never seen one. All the cards I have ever seen them on they are coloured bright red, but your photographs show them more as a fabulous peach colour, they are so pretty. I am always so amazed by your cards Pamellia .. this one is totally divine. Love the soft colours and the bit of twisted ribbon over the lace looks so effective and so pretty .. absolutely adore this!! 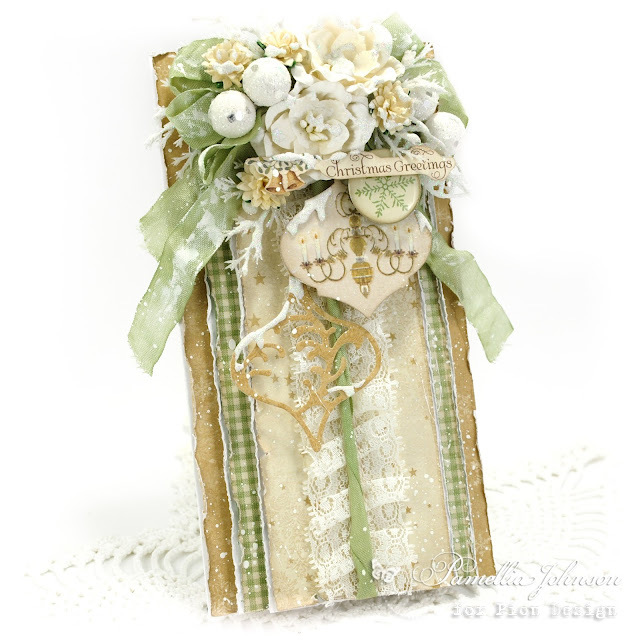 Vintage, shabby AND elegant all rolled into one amazing card at your talented hands! I love this design, and the arrangement spilled down from the top is a show stopper! Your photos are just as amazing and I'm so enjoying the snow through your camera lens, but I sure wouldn't want to be shoveling it! I'm so surprised you were able to get this clear of shots, because you must have been shivering! Wind, snow and cold for 5 hours! Bring on the fuzzy socks and hot chocolate! Great landscape photo--yes I was fooled! And the macro looks like rock candy! Such a joy it is to visit your blog this morning! Sending you big hugs! So lovely, and so elegant indeed! These papers are marvellous in your hands, Pamellia! your cards are a sheer beauty to look at and this one is no exception. I love your photos of the Cardinals. We don't have them in the UK. hugs Mrs A. Well you do make the papers seem to be versatile but I wouldn't even know where to start. Lol. Such a lovely color green these are. Very soft and vintage looking. The ornament dies are beautiful and I do enjoy that you out a chandelier for one, something unexpected and fantabulous. I have to give you a major shout out for the video of the card in your last post. The video was awesome sauce and I learned a lot as usual. Hehe. Such a beautiful, elegant card - I really love the delicate colour palette. More magnificent photos - those ice crystals are incredible.